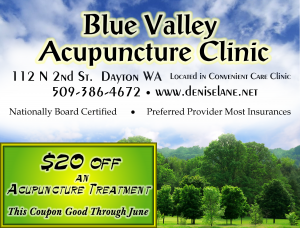 BLUE VALLEY ACUPUNCTURE CLINIC-LOCATED IN DAYTON, WA.-SERVING GREATER WALLA WALLA, WA. AREA AND NEARBY TOWNS. Acupuncture may be helpful in treating migraines, arthritis and chronic pain. Has acupuncture worked for you? Join in the discussion. « Acupuncture Effective for Low Back Pain-Serving Walla Walla, WA., Dayton Wa.